Tonight I made a bunch of chocolate dipped pretzels. I rolled them in multicolored nonpareils because I thought they looked cute. 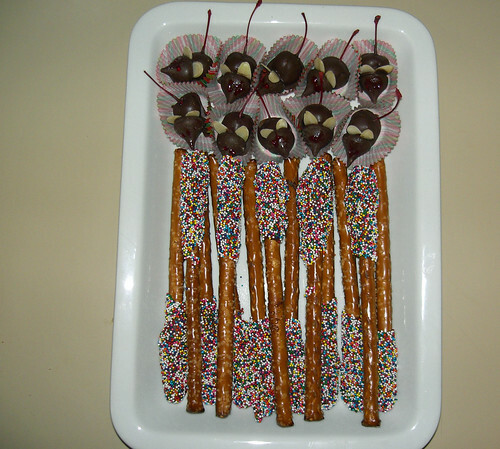 I really dont like pretzels and chocolate, but a lot of people I know love them so I made a batch for them. They look great on a plate with my chocolate mice, who’s eyes unfortunately mostly smeared in the container they were living in . Now they are blind mice, I suppose. I’ll be bringing these over to my friend Jess’s house tomorrow for cookie party. Last year cookie party was actually a cookie swap with about 10 people, but this year its only going to be 4 of us and we are just getting together to decorate sugar cookies. I’m really looking forward to it though, I hardly ever get to get crafty with other people!